A second-half Worthing fightback earned them a point at Bognor - after a storming first-half display by the Rocks looked like it had set them up to complete the league double. 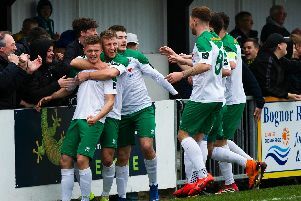 Early goals by Mason Walsh and Joe Tomlinson put Bognor in charge before a contentious penalty converted by former Rocks defender James Crane and an injury-time Jesse Starkey strike denied the hosts another win over their rivals. The result would have felt like a loss to Bognor and a win for Worthing, whose fans let off smokebombs and celebrated wildly at the end. For Bognor it is another failure to claim home points which is threatening to derail their play-off bid on a day when they were further hit by illness and injuries. The result leaves both sides where they were at the start of the day in the table - Worthing fifth and Bognor seventh. It was one of the most keenly anticipated games of the season at the Lane with the Rocks hosting their near neighbours and fierce rivals less than three months after winning 2-0 at Woodside Road. But there was bad news on the Rocks teamsheet – which showed they were without two strikers: Jimmy Muitt was missing after picking up a knock last week in the loss to Haringey while Leon Maloney had been struck down with illness. Bognor were to use Walsh and Harvey Whyte in advanced roles to support centre-forward Brad Lethbridge. Worthing included two ex-Rocks in their starting XI and one on the bench – with Ollie Pearce and James Crane in the line-up and Alex Parsons among the subs. Bognor and Worthing have both been in or around the Bostik premier play-off zone for much of the season and this felt like anyone's game at kick-off - though Worthing had beaten Bognor only once in their past 18 meetings. Kwame Adubofour-Poku had the first chance of the game just two minutes in, drawing a good parried save from Dan Lincoln after a nice through-pass by Pearce. Lethbridge should have done better when he found himself in space in the area – but his shot was blocked when he could have played Walsh in with a great chance to score. Worthing were the stronger side in the early stages but it was the Rocks who took the lead from a superb counter-attack. Lincoln's quick throw set the move going and Lethbridge did well to surge down the left and into the box, shrugging off his marker before squaring for Walsh, who couldn't miss from five yards. Adubofour-Poku almost pounced on a poor back pass by Harvey Read but saw his shot deflected into the side netting. It was a lively opening to the game and in a crackling atmosphere, with both sets of fans making themselves heard. Worthing were winning a number of corners, one coming from a low Starkey shot that was deflected, but were not able to make any count. It was 2-0 out of nothing on 21 minutes. Bognor got the ball into a crowded box and when Doug Tuck played a short pass to Tomlinson, he turned and saw a low curling shot helped in by Worthing keeper Lucas Cavagnari, who really should have kept it out. Bognor had their tails up and forced Cavagnari into a hurried clearance – and then Lethbridge ran through but couldn't trouble the keeper as a defender crowded him out. Worthing were forced into a change on 29 minutes as defender Danny Barker came off injured to be replaced by Joe Clarke. Lethbridge had a fantastic chance to make it 3-0 on 36 minutes when a cross from the right found him unmarked five yards out but he couldn't get the ball out from under his feet and his effort was blocked – and the young striker went down injured, but was okay after treatment. Tuck picked up a yellow card five minutes before the break for tripping David Ajiboye in a Worthing attack. A long diagonal ball by Theo Widdrington found Whyte, who cut inside but could get no power on his shot as the Rocks looked for a third. Worthing began the second half on the front foot, pushing Bognor back to defend – desperately at times – as the visitors looked to get themselves back into the game. Widdrington was the second player to be booked, seeing yellow for a needless 54th minute tackle in the Worthing half. A couple of Worthing corners caused a few moments of concern for Jack Pearce – barking orders from the stand – and Robbie Blake in the technical area. Bognor were disrupted just before the hour when Calvin Davies went down in agony. A stretcher was quickly called for though it was not immediately obvious what he had done. He was later seen back on his feet but appears to have suffered a new knee injury, just a couple of weeks after recovering from a similar problem. Tommy Scutt replaced him, with Whyte dropping back to right-back. Starkey went down very easily as he went to try to meet a ball across the Bognor box – he wanted a penalty but was never likely to get one. Then Lethbridge ran half the length of the field but couldn't find Walsh in the box. Joel Colbran was booked for a cynical foul on Walsh on halfway. A brilliant run down the left by Walsh ended in a cross towards the lurking Lethbridge, but Cavagnari gathered it at the near post. Richard Gilot was booked on 66 minutes for halting Ajiboye – before Parsons came on for Jasper Pattenden. Widdrington swung a high free-kick in that Read met unmarked but could not get a decent connection on – then Worthing went straight to the other end and Ajiboye shot well but just wide. Worthing got a lifeline with 16 minutes to go when Whyte was harshly - and most thought wrongly - judged to have handled as he tried to clear a dangerous cross. After Lincoln was booked for time-wasting, Crane sent him the wrong way from 12 yards. Worthing immediately went on the attack looking for an equaliser and the Rocks shored up the defence with Keaton Wood coming on for Tuck, who appeared to have taken a knock. Then with Walsh struggling with cramp, a third Rocks change brought Ed Sanders into the fray. He went straight up front and joined in an attack that was halted by an offside flag. The crowd size was confirmed as 1,137 – a number that included, among others, former bosses Jamie Howell and Darin Killpartrick and former Pompey manager Graham Rix. As things got bad-tempered Starkey was booked for shoving Whyte to the ground. That was the last action as the sides settled for a point – one that will seem more valuable to Worthing than to Bognor. Rocks: Lincoln, Davies, Tomlinson, Tuck, Field, Read, Whyte, Widdrington, Lethbridge, Gilot, Walsh. Subs: Scutt, Wood, Heath, Sanders. Worthing: Cavagnari, Colbran, Crane, Aguiar, Barker, Jones, Ajiboye, Adubofour-Poku, Pattenden, Pearce, Starkey. Subs: Young, Parsons, Clarke, Kealy, Perntreou.